Today we received a donation of £500 from Daventry engineering firm Cummins. 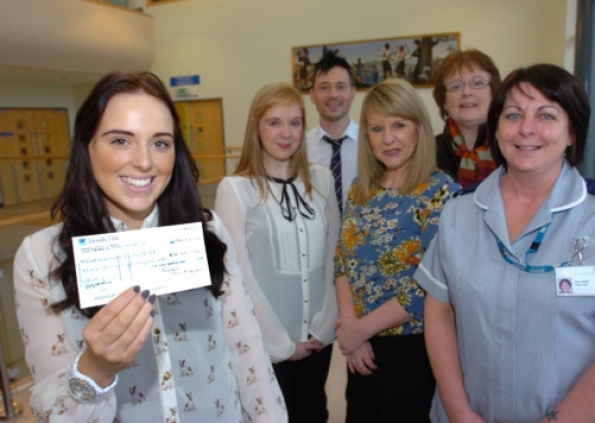 Katherine Miller pictured, accepted the cheque on behalf of the Trust. Thank you to Cummins for donating such valuable funds! A poignant way to mark Gary's birthday, to celebrate and reflect on Gary's wonderful legacy. 16th May saw the return of Electric River, Maximum Jam and a special appearance from Tony Shaw. The evening was a great success, £1190 was raised for the GB Trust. A big thank you to the music acts and organisers Richard and Nick who again held a fantastic music night in support of the Charity. Richard Haynes and Nick Clift organised a music gig which included performances from Maximum Jam and Electric River. A big thank you to the organisers who succesfully raised £946.50 for The GB Trust and held a great music night for the Daventry community. 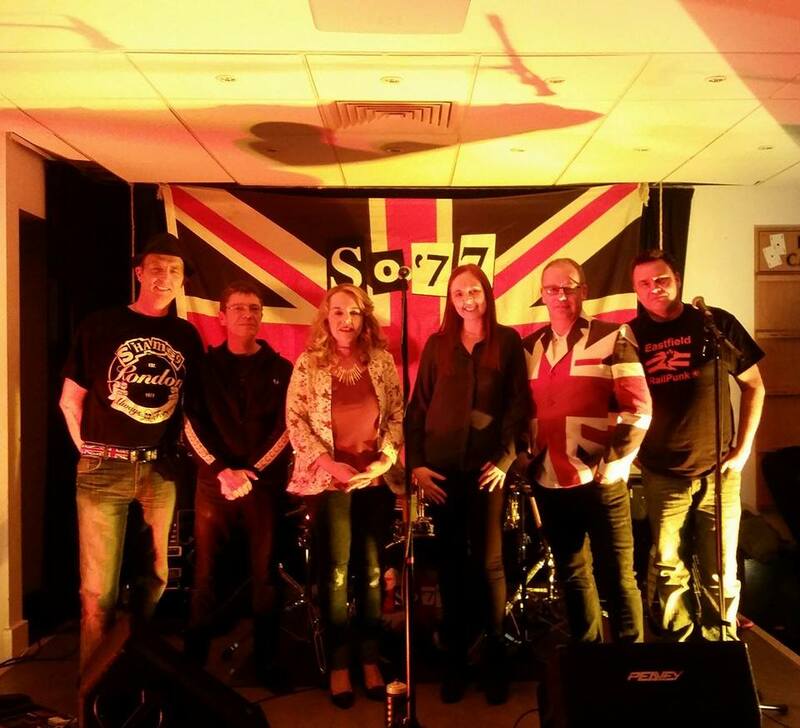 Local energetic band So77 performed some of the finest tunes by The Clash and The Jam during a music gig organised by Phil Beech, the band's guitarist. 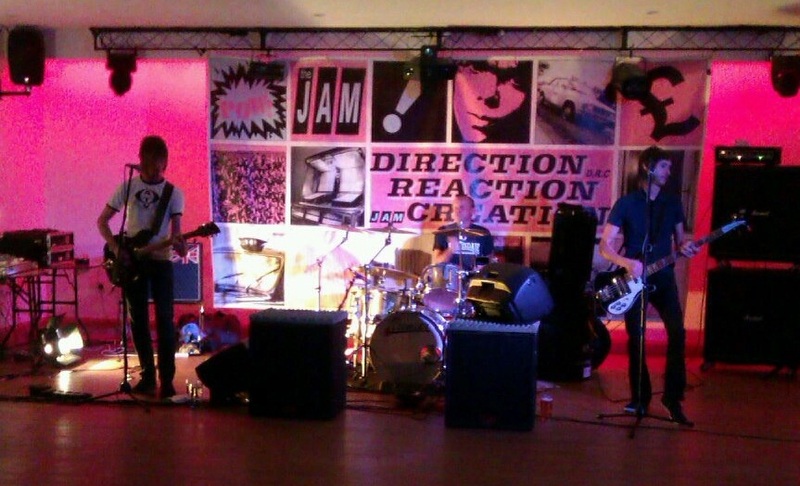 So77 were brilliant as always and a fantastic £637.12 was raised for the Charity. Trustees Julia and Emily are pictured with the band members; Phil Beec, Nigel Lewis, Bryan Goodall and Mark Jones. A big thank you to Phil for organising an awesome night. "That's Entertainment!" Samantha Tank decided to organise an Elvis Tribute night in support of The Trust after her own recent personal experience of Talbot Butler Ward at Northampton Hospital. The evening successfully raised £615.10 for the Charity. 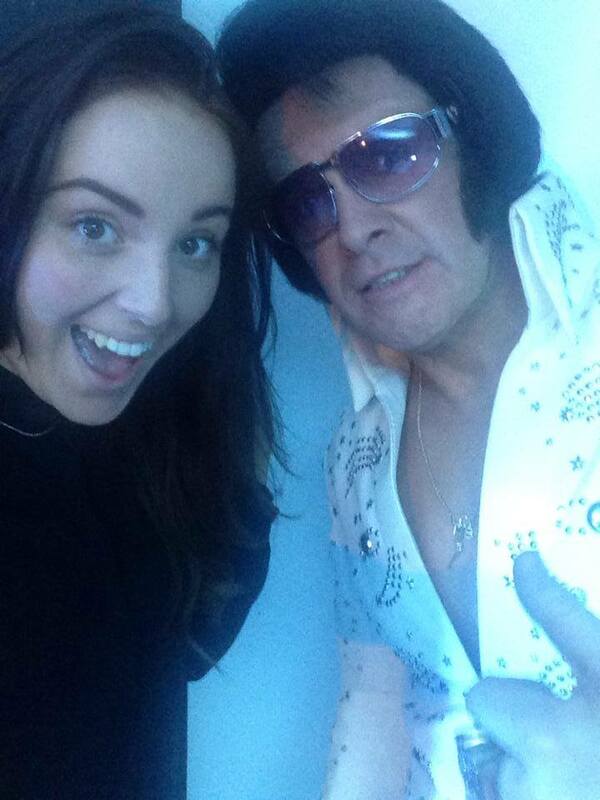 Trustee Laura is pictured with Elvis, having a sneaky selfie! Thank you for arranging this event Samantha, it was a great evening enjoyed by many. On 14th September it would have been Gary's 50th Birthday and we are very proud to announce that to commemorate this special birthday Trustees Emily Barton-Lewis and Mary Bevan presented £2000 to Cawthorne Ward at Danetre Hospital. The donation will be used for the purchase of an Ultra Low Bed, an essential piece of equipment that ensures patients are comfortable and remain safe. A big thank you to all of our supporters for your continued support. Photo courtesy of the Daventry Express. Dan completes the Silverstone Half Marathon! Daniel Barton-Lewis took on his first ever half marathon and chose to do so in support of The GB Trust. 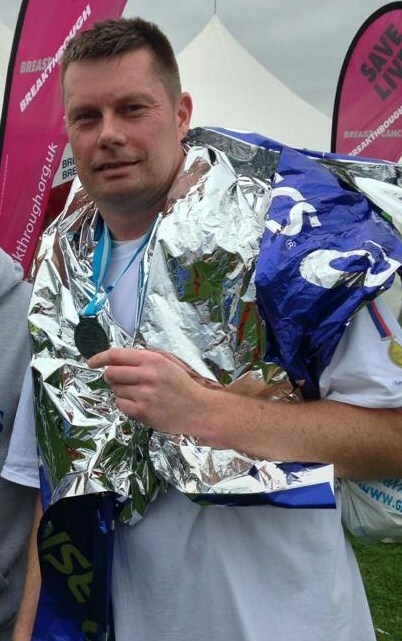 Dan completed the Adidas Silverstone Half Marathon on March 2nd 2014 and raised a fantastic £572.00 for The Trust! 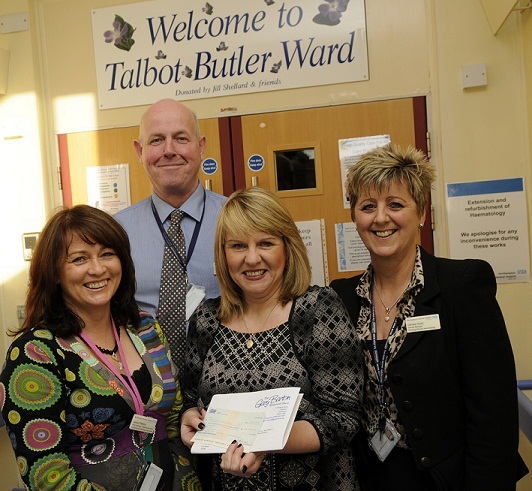 The Gary Barton Memorial Trust are proud to announce we have made a donation of £3725.00 to Talbot Butler Ward. 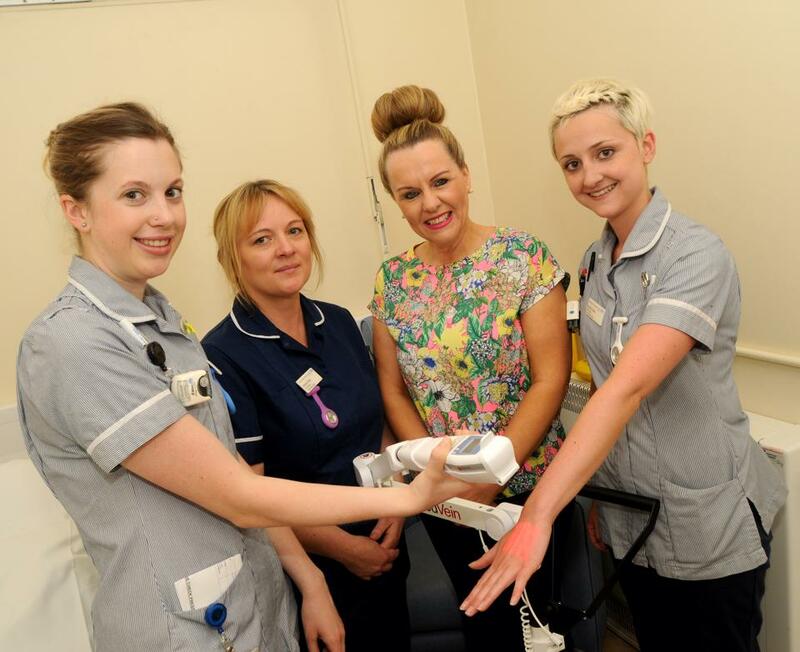 The donation will be used to purchase an AccuVein AV300, a tool that helps locate the veins ahead of inserting a cannula to give chemotherapy. From our personal experiences with Gary, we know how after several treatments the veins can weaken and become difficult to locate. The Talbot Butler Ward staff have chose this equipment to aid insertion of cannula's and blood taking. 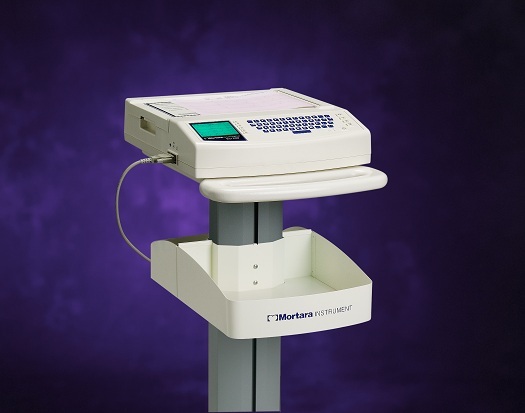 This equipment can help reduce the need for repeated attempts to locate veins which can sometimes distress the patients. We would like to thank our supporters for your continued support and fundraising which enables the Trust to purchase vital equipment for the two wards we support. Barry takes on the Great Run of the North & South! Barry Hambridge has been a very busy man as in the past two months he has ran two Half Marathons, the Bupa Great North Run and Bupa Great South Run. Barry participated in both events in support of two Charities - Help for Heroes and The GB Trust. 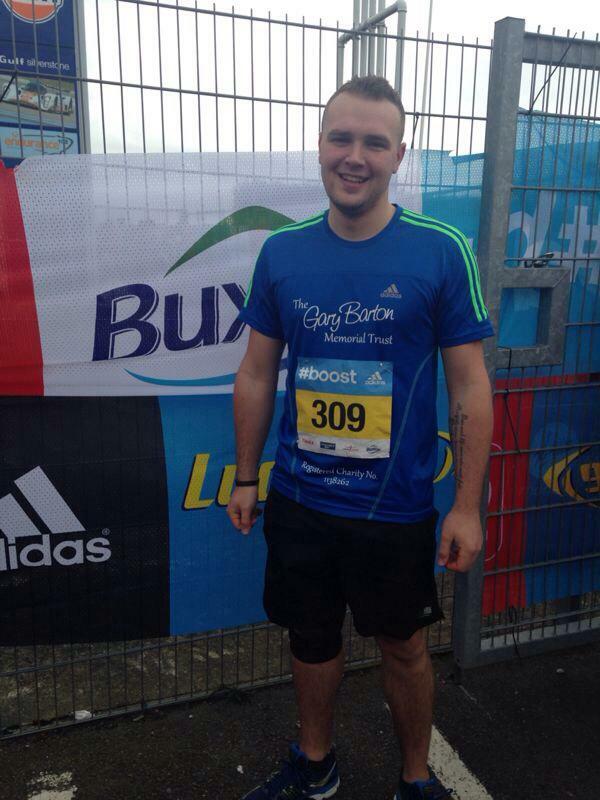 First up was the Bupa Great North Run on 15th September which Barry completed in 02:08:19. Barry then headed to Portsmouth on 27th October for the Bupa Great South Run and despite the wet and windy conditions he beat his previous time and completed in 01:35:33. Well done Barry! Overall Barry raised £420, thank you to all who sponsored Barry and thank you to Barry for all your running! Pictured is Barry after completing the Great North Run. 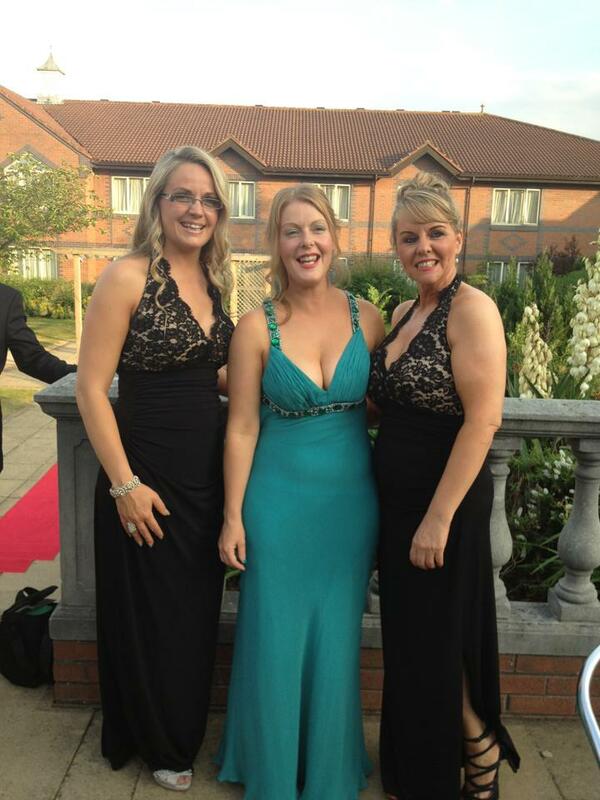 Sharon Baker from Belle Femme Nail and Beauty Salon hosted a Charity Summer Ball on Saturday 14th July to coincide with their 10th year Anniversary and chose The Trust as one of the Charities to support. A fantastic £1256.94 was donated to The Gary Barton Memorial Trust from the glitzy and glam celebrations, plus All Aspects Care donated £606.98 direct to the Trust after sponsoring the arrival drinks. We would like to thank you for raising such an amazing amount and for hosting a truly wonderful evening. 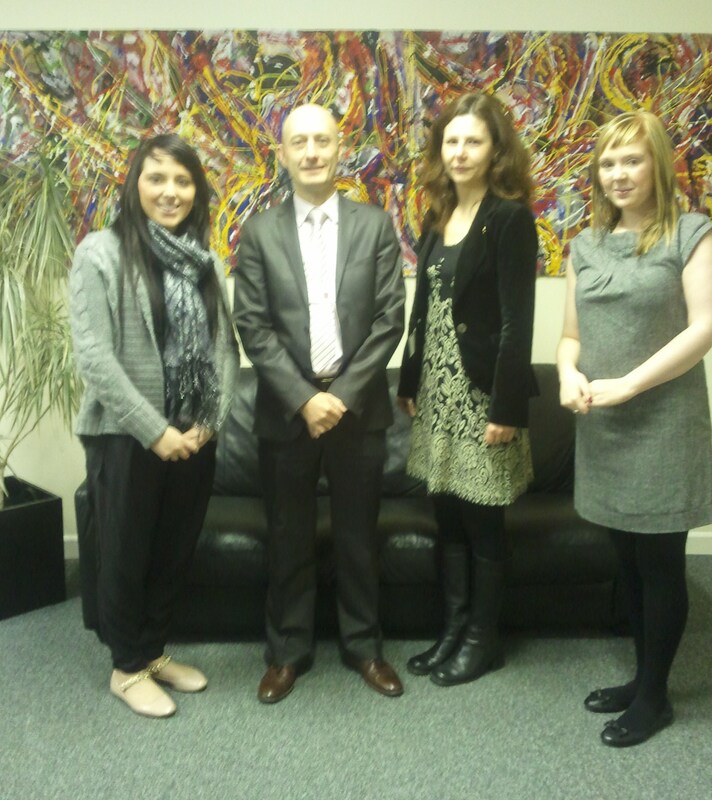 Pictured is Sharon from Belle Femme, Nina from All Aspects Care and Julia, Trustee for The GB Trust. On Sunday 14th April Football For Charity hosted a charity football match at Daventry Town FC against screen stars from soaps such as Corrie, Hollyoaks and Emmerdale. The GB Trust were chosen as one of the event's nominated charities along with other local causes. The Trust held one of it's infamous Toy Tombola's at the football match as Tesco Wincanton kindly donated brand new toys to the charity which meant we successfully raised £149.50. 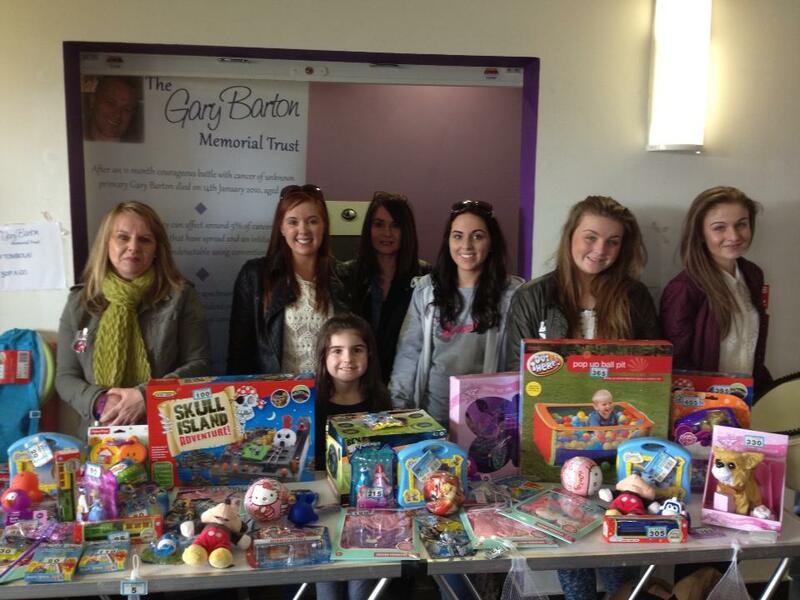 Pictured is The Trust girls working on the Toy Tombola and ready to mingle with the soap stars! On Wednesday 9th January 2013 The Gary Barton Memorial Trust donated £4000 to Cawthorne Ward at Danetre Hospital. We would like to take this opportunity to thank you all for your continued fundraising which allows us to provide essential equipment to both of the wards we support. The donation to Cawthorne Ward will be used for the purchase of a new nimbus 3 specialist mattress, please find below a thank you from Patsy Hatfield, Cawthorne Ward's Palliative Care Team Leader. allows them to remain in bed. raised £105 and Trustee's Emily and Julia who hosted a Toy Tombola in a lovely log cabin at Northampton's Christmas Quarter raising £85.50! 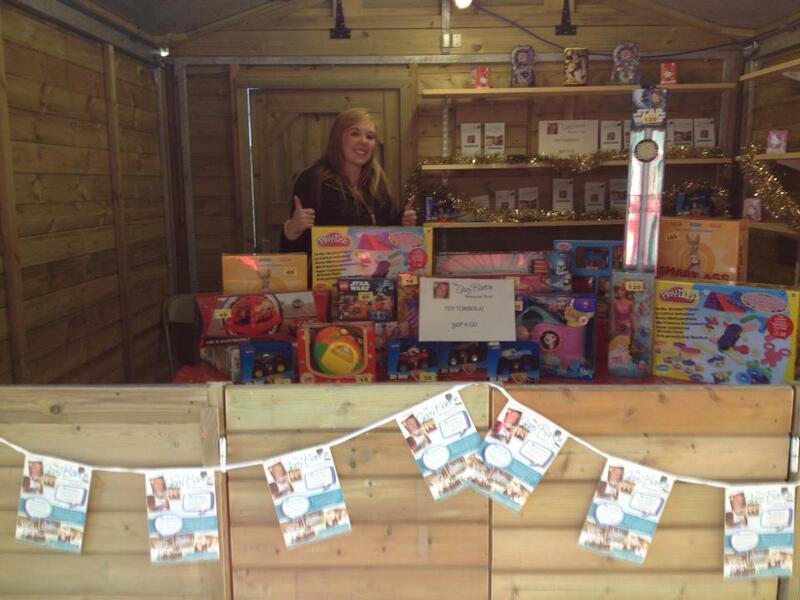 Christmas Toy Tombola which raised a fabulous £88.50! The Trust's final Christmas fundraiser was a Christmas Toy Tombola at Northampton Town FC's Christmas Arts and Crafts Market which raised £189! 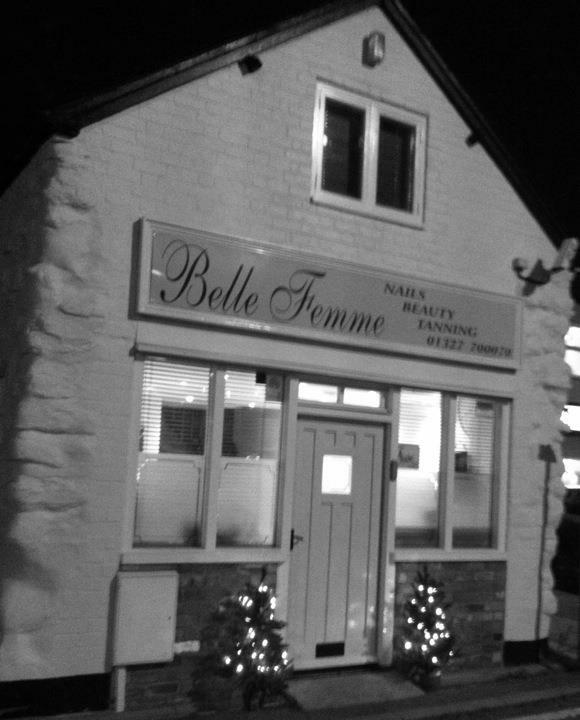 Belle Femme Nail and Beauty Salon in Daventry kindly hosted a Christmas Open Evening in support of The Gary Barton Memorial Trust. and an opportunity to see a range of fantastic gift ideas. 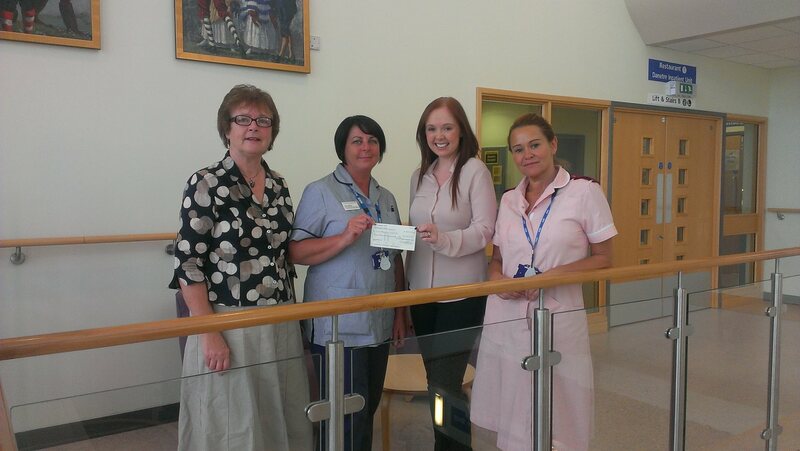 Memorial Trust, raising a fantastic £100! On Friday 27th April, Trustees Julia and Emily attended the Cancer of Unknown Primary (CUP) Conference at the Royal College of Physicians. Julia was a representative on the patient experience expert panel and shared with the audience Gary’s journey and her experience of being a carer for a CUP patient. 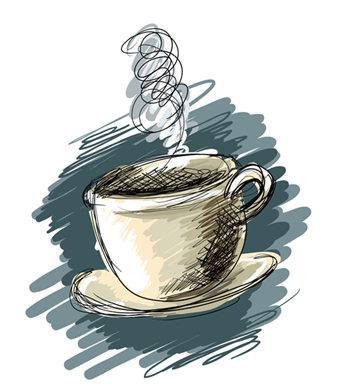 The Trustees felt the day was extremely worthwhile and enabled a forum for the exchange of information about CUP; furthermore it offered the opportunity to learn of the progress in the search for improved diagnosis, management and treatment of CUP. 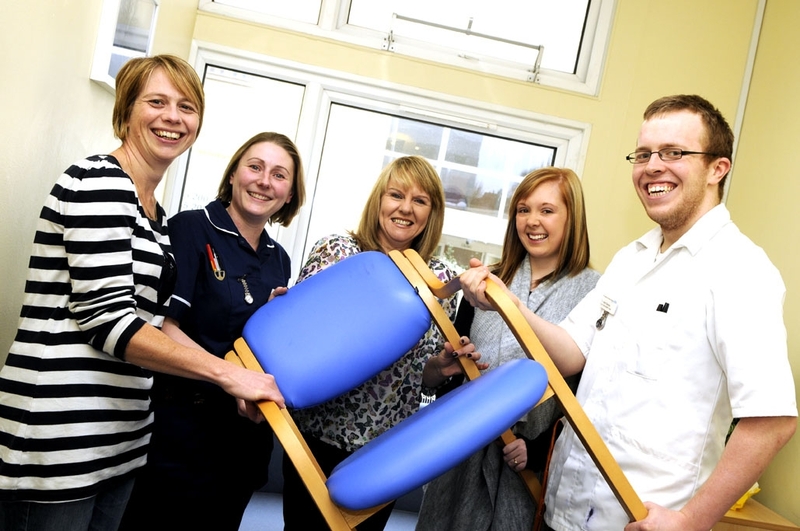 Trustees returned to Talbot Butler Ward to view the chairs recently provided by the Trust. In December 2011 a donation was made to Talbot Butler Ward of £3444.55 for the purchase of thirty new chairs for the use by patient's relatives and seven chairs for staff use. An article will appear in the next issue of the Insight Hospital Magazine, providing further details. Thank you to everyone for your continued support and enabling the Trust to provide equipment required. 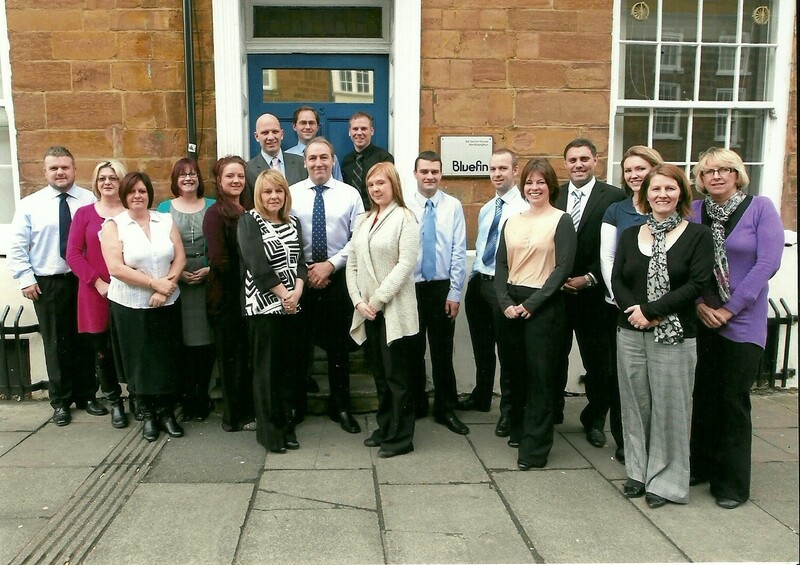 Neil Hoppitt and his work colleagues held several dress down days in support of the Trust. Bluefin raised a fantastic amount of £500 and are shown here presenting the cheque outside their offices in Northampton. Jason Lee from Daventry Town Football Club presents a cheque for £1500 to the Trust after a Liverpool Legends match was held at the Club. The Trust presented a cheque for £3444.55 to Talbot Butler Ward for the purchase of thirty seven chairs for staff and patient's relatives. 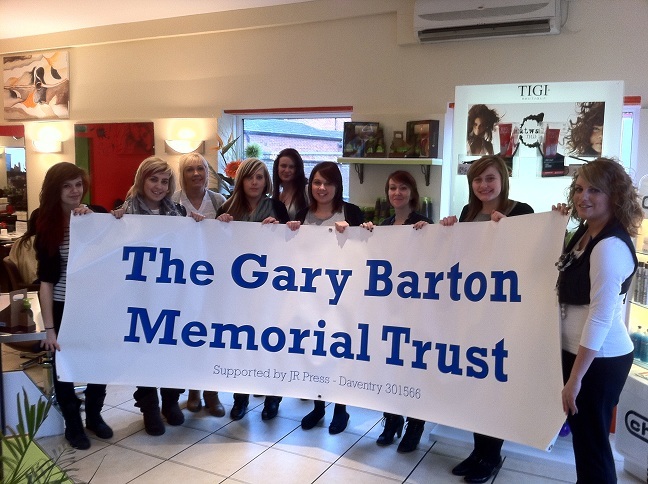 On Monday 28th November, Belle Femme Beauty Salon held a Christmas Open Evening in support of The Gary Barton Memorial Trust. The evening included festive drinks and nibbles, treatment samples, a goodie bag and an opportunity to see a range of fantastic gift ideas. We would like to thank The Belle Femme team for kindly hosting the evening and donating all £5 fees to The Gary Barton Memorial Trust, raising a fantastic £155! 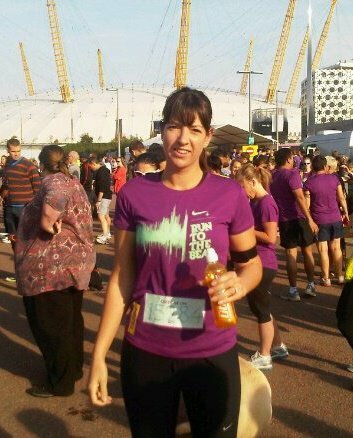 After running the Windsor Half Marathon in September 2010, Jenny Cousins set herself a new challenge to complete the Run to the Beat Half Marathon on 25th September in support of The Gary Barton Memorial Trust. Jenny completed the course in a fantastic 2 hours and 11 minutes - a personal best! Well done Jenny. 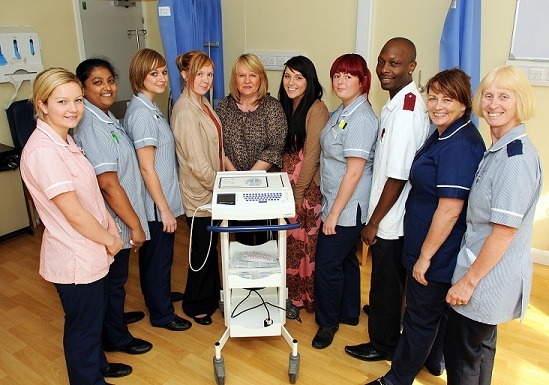 In February 2011, The Gary Barton Memorial Trust donated £4742.30 to Talbot Butler Ward at Northampton General Hospital, to be used for the purchase of an ECG machine. After the arrival of the ECG machine, Julia and her two daughters Emily and Laura visited Talbot Butler Ward on 15th September 2011 for a formal presentation. The Gary Barton Memorial Trust would like to thank all those who continue to support the Charity and allowed us to purchase a vital piece of equipment for Talbot Butler Ward. On 4th September The Gary Barton Memorial Trust joined other local charities at a local DHL Fun Day. The Trust had a Toys Tombola stall and raised £101. On 2nd September Daventry Town FC kindly hosted a Jam Night in support of The Gary Barton Memorial Trust. The Jam DRC and support act John Backo performed many of The Jam and Paul Weller hits, with all ticket proceeds donated to The Gary Barton Memorial Trust. The Trust also held an auction at the event which included items such as a Limited Edition Lambretta Helmet signed by Liam Gallagher. This was a great night for all those who enjoy music from The Jam era and raised a fantastic £1090 for The Gary Barton Memorial Trust. On the 31st July Irene Bean celebrated her 80th Birthday and kindly donated £275 to the Trust in preference of Birthday gifts. Also on the 13th August Jennie Hayes celebrated her 70th Birthday and also in preference to gifts donated £500 to The Gary Barton Memorial Trust. We thank Irene and Jennie for their generosity. 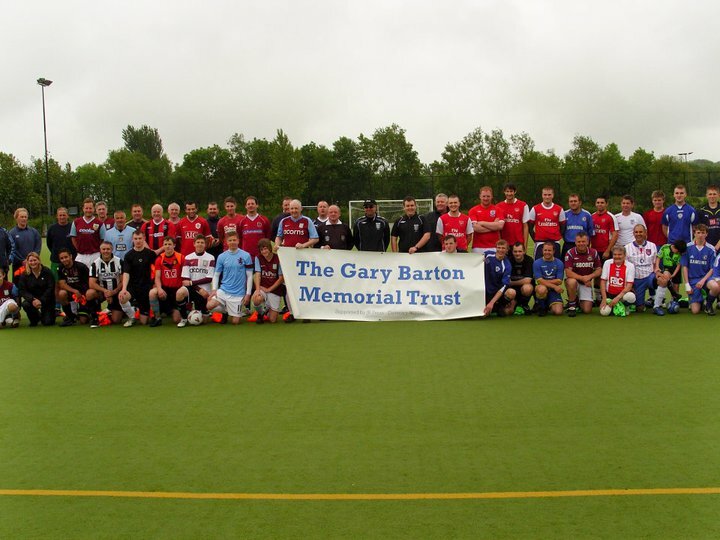 The Gary Barton Memorial Trust would like to thank all the players and officials who participated in the Gary Barton Memorial Football Match on Monday May 30th. The match result was 2-0 to the North, however both teams played great football and made it a very exciting match to spectate. Also thankyou to those who supported the toys tombola, raffle and auction, the amount raised on the day was a fantastic £2829.20. 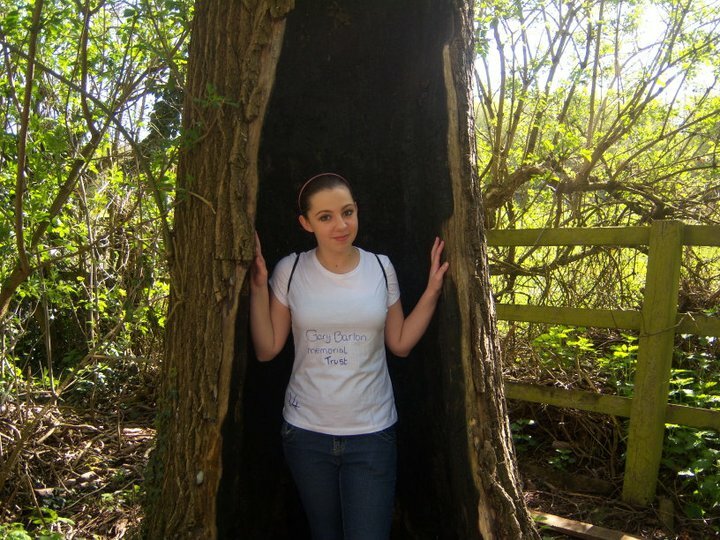 The Gary Barton Memorial Trust would like to thank Rebecca and Aimee for raising £64.00. As part of their citizenship homework Rebecca and Aimee ran the Daventry Country Park and decided to donate all sponsorship money to The Gary Barton Memorial Trust. 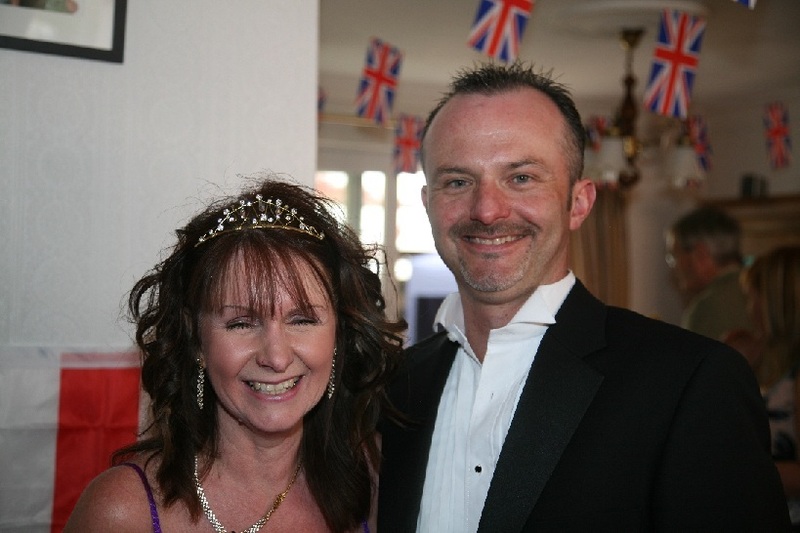 To coincide with the celebrations of the Royal Wedding, Beverley and Adrian Andrew decided to host their own Royal Wedding Party in support of The Gary Barton Memorial Trust. Guests were required to dress up as wedding guests and make a small donation, with a Royal Wedding themed raffle also taking place. The celebrations raised a fantastic £572.29 for The Gary Barton Memorial Trust, we would like to thank everyone who attended the Royal Wedding Party. On the 20th March 2011 Carol Tennant and Bethany Jackson ran the Reading Half Marathon in support of The Gary Barton Memorial Trust. The decision was made to run in memory of Carol's cousin Gary and the girl's close friend Hayley Mounce. The girls completed the course in a fantastic 1 hour 47 minutes and raised a fantastic £387.51 for The Gary Barton Memorial Trust. The Trust today handed over a cheque for £5000 on behalf of The Gary Barton Memorial Trust. 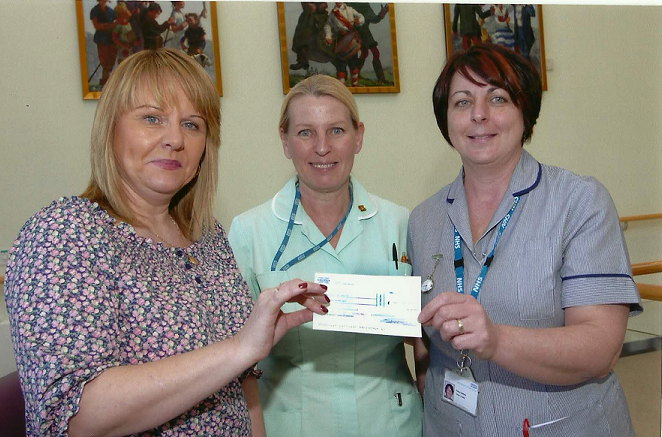 The cheque was handed over to Patsy Hatfield, Team Leader of Cawthorne Ward, at Danetre Hospital. The money will be used to purchase syringe drivers for the ward, vital pieces of equipment for palliative care patients. We would like to thank the Danetre Rotary Club for very kindly donating £250 to The Gary Barton Memorial Trust. Trustees met with The Rotary Club in January, to talk about The Gary Barton Memorial Trust such as the events we have held so far and what the money we raise is used for. We appreciate The Rotary Club taking the time to learn about the work of The Gary Barton Memorial Trust, and would like to thank all their members for supporting The Gary Barton Memorial Trust. The Gary Barton Memorial Trust are pleased to announce that a cheque for £4742.30 has been handed to Talbot Butler Ward at Northampton General Hospital, to be used for the purchase of an ECG machine. Once the ECG machine has arrived a formal presentation will be taking place. 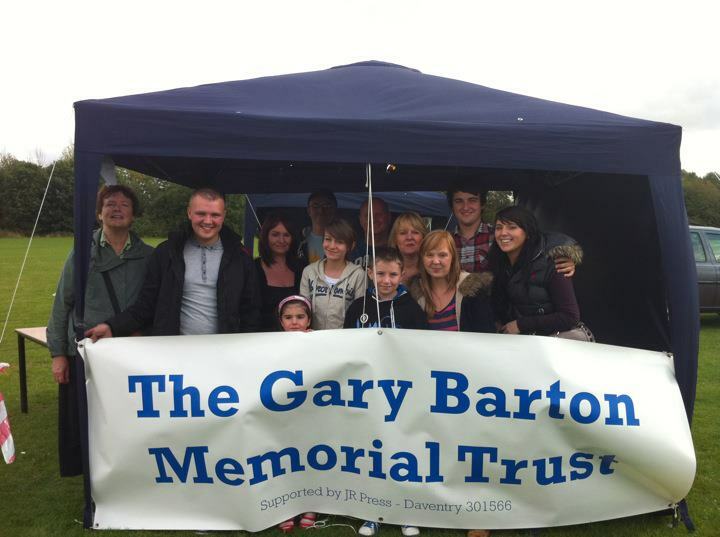 The Gary Barton Memorial Trust would like to thank everybody who has supported and helped us raise such a fantastic amount since the Trust created in April 2010. 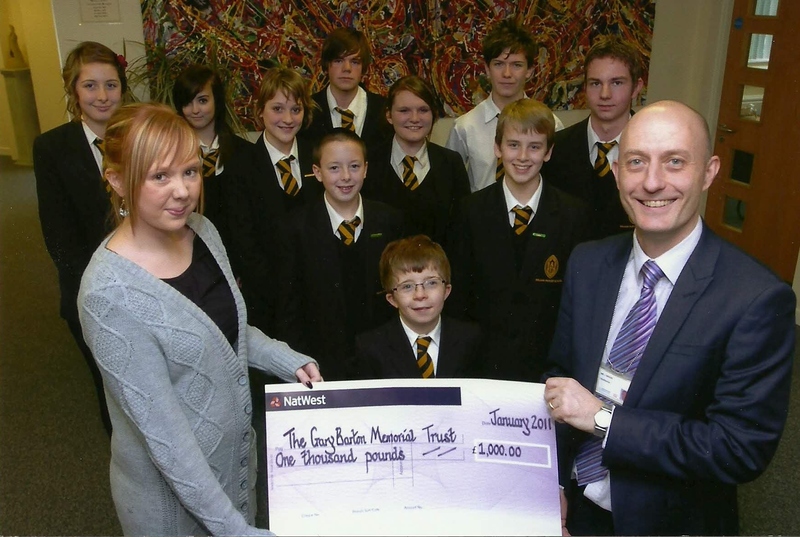 The Trust recieved a cheque today for £1000 from Headteacher Mr Brook and students from Daventry William Parker School. The school held a non-uniform day in December 2010 to raise this fantastic amount, a big thankyou to all the students for supporting The Gary Barton Memorial Trust. The Gary Barton Memorial Trust would like to thank Slave Hairdressing for organising a raffle in the salon and raising £100 for the Trust. Thankyou to all the staff and clients. We would like to thank the staff from the Daventry Mental Health for Older People service who donated £42.00 to The Gary Barton Memorial Trust in preference of sending Christmas cards. Gary Barton's niece Mia and her friends Saffron, Amelia and Charley decided to get into the festive spirit by Carol Singing in their neighbourhood in Desborough and donated all monies raised to The Gary Barton Memorial Trust. Thankyou to the girls who braved the cold weather and raised a fantastic £60.77. 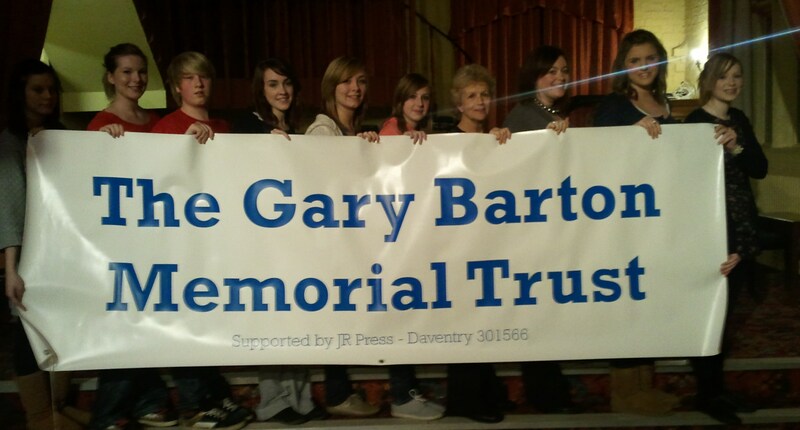 The Daventry Players performed a range of songs from across the decades in support of The Gary Barton Memorial Trust. Along with a christmas raffle, The Daventry Players raised an amazing £350.00. A big thankyou to all who took part in the show and those who came along to support the event. On the 10th December, William Parker School students are kindly holding a mufti day with all funds raised being donated to The Gary Barton Memorial Trust. Every day this week Gary's daughters Emily and Laura have returned to the Secondary School which they previously attended to give an assembly to the students of each year group, about the charity and what the money they raise will go towards. Pictured with Emily and Laura are Jason Brook, the Headteacher of William Parker Scool and Ruth Roberts, Assistant Headteacher. The Gary Barton Memorial Trust coffee morning with a Christmas Tombola raised a fantastic £306.25. A special thankyou to Patisserie Valerie who donated the lovely cakes. Belle Femme Beauty Night ! Belle Femme Beauty Night was a very successful evening, with ladies being treated to a file & polish on both nails and toes plus an eyebrow wax - all for just £10! 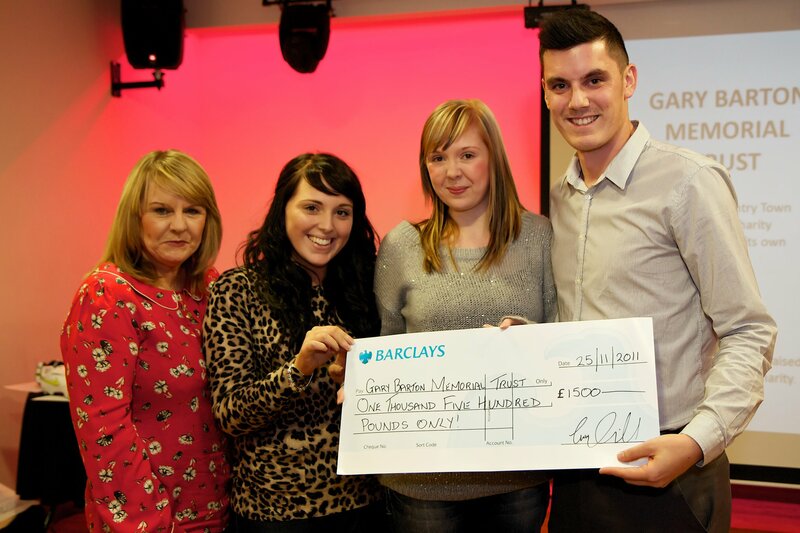 With everybody feeling pampered, a great amount was raised in support of The Gary Barton Memorial Trust. Girl Power for Gary ! 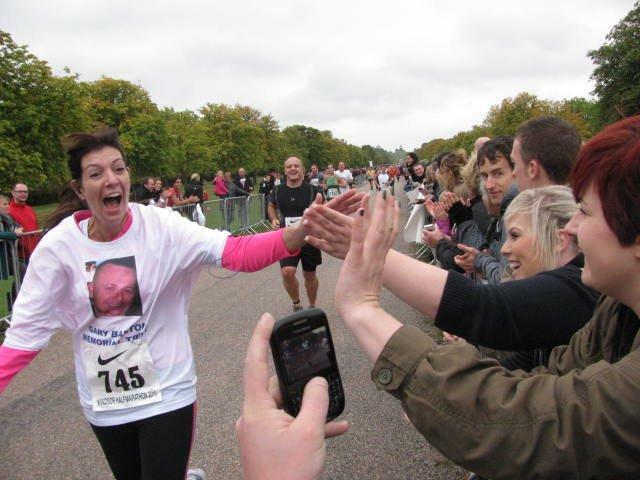 Jenny Cousins ran the Windsor Half Marathon on Sunday 26th September in support of The Gary Barton Memorial Trust, completing the course in a fantastic 2 hours 18minutes and raising £405 in memory of Gary. Roisin Bevan ran the Great North Run on Sunday 19th September in memory of Gary, completing the half marathon in a fantastic 2 hours 34 minutes. Peter Worth and Kevin Hart have completed their cycle from Daventry to Weymouth in support of The Gary Barton Memorial Trust, Gary's brother-in-law and close friend were welcomed into Weymouth by family and friends at The Prince Regent Hotel on the seafront. To see how the cyclists got on click on the link below to view their blog. A special thankyou to Nigel Mckie Ltd who provided the support vehicle, diesel,food and accomodation for the cyclists. Also the Trust would like to thank Grovesnor Cars for also contributing towards food costs and Barry Hambridge for following the cyclists in the support vehicle during their journey. Trustees returned to the John Griff show on Radio Northampton, to update the presenter on The Gary Barton Memorial Trust's fundraising and the launch of a new website. 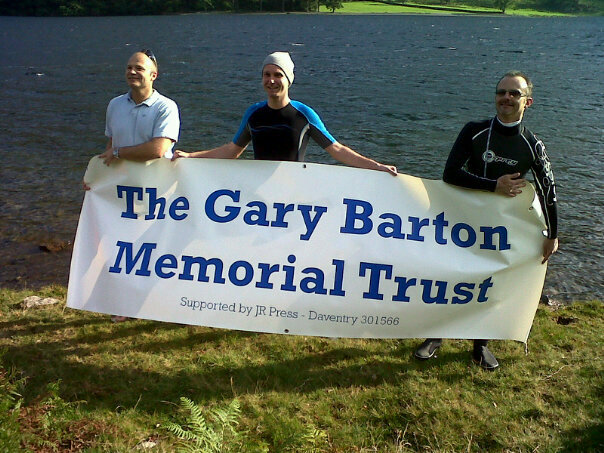 Well done to Jason Fretwell & Andy Clements of AO Smith Water Heaters and Adrian Andrew of Andrew Pipework Service for completing this years triathlon event in the Lake District in support of The Gary Barton Memorial Trust. The guys had a tough challenge to face, including swimming across the lake (approx 1/2 a mile and 60ft deep), Cycle Honister Pass (approx 4 miles all uphill) and then had to take on the Fell Walk (approx 8 miles) but managed to complete the challenge successfully. 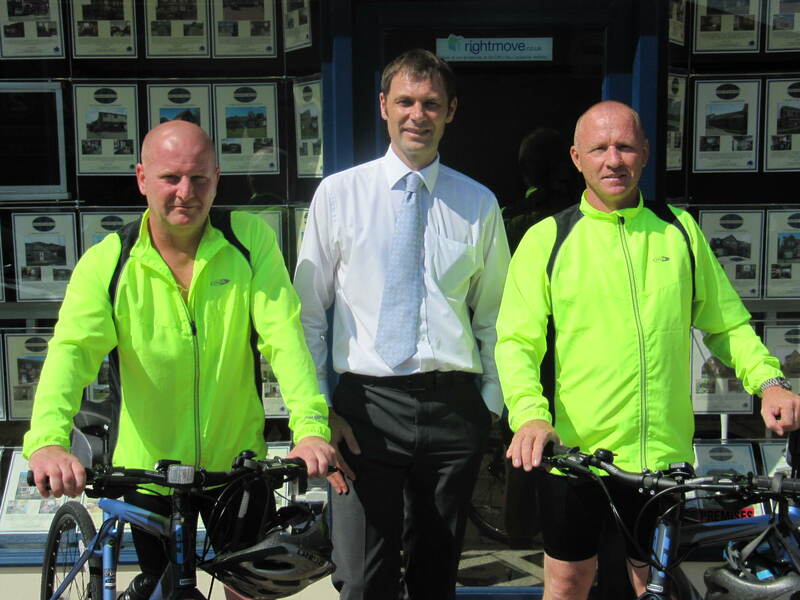 Four local companies have pledged their support to The Gary Barton Memorial Trust by backing Peter Worth and Kevin Hart, who on the 15th September will be undertaking a cycle ride from Daventry to Weymouth. A very big thankyou to Tremayne & Belcher Estate Agents, Danetre Garage Vauxhall, Nigel Mckie Paving Ltd and Venture Caravans who have supplied bikes, a support vehicle and provisions to enable the two to complete the journey. 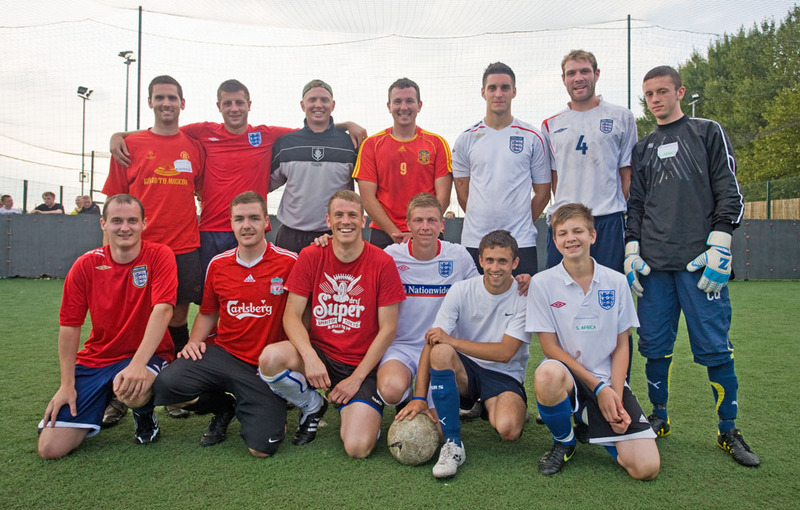 32 teams participated in a 5-a-side tournament hosted by Vital Saloon, on the 15th August. The competition ran based on the World Cup, with each team having a World Cup team name. The finalists were South Africa vs Australia, with Australia winning the World Cup trophy. Also well done to Denmark who were team of the tournament and Josh Bellamy who was the top goal scorer. Over £1,300 was raised at the event, a big thankyou to Vital Saloon, Kelly Hall for presenting the trophy and all the teams and supporters that took part.